A trail camera is vital to a hunter as a hammer to a carpenter. It helps to bring success in every hunting expedition and ensure a bounty catch. Every hunter knows that hunting the forest without a trail camera is like attending a battle without a weapon. Therefore, it is crucial that you choose the right trail camera that will suit your needs. With a variety of choices from the market, you only want the best for your hunting needs. 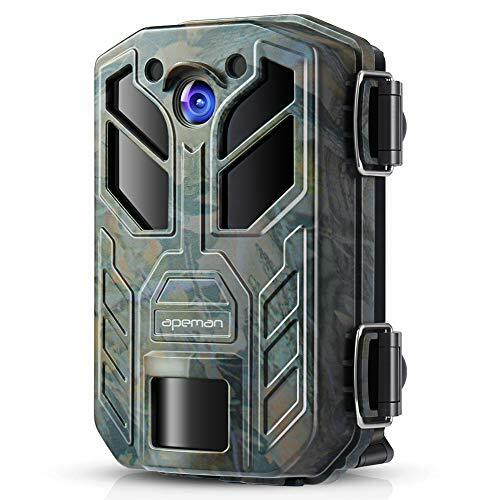 To narrow down your choices and to eradicate poor-quality cameras on the list, why don’t you take a look at the best models of Apeman trail cameras? Established last 2016, Apeman is one of the best-known products when it comes to trail and action cameras. They are reputable for incorporating the latest technology to their gadgets and offering optimal convenience to the hunters while they’re on the field. If this is your first time buying trail cameras, you might want to buy a model that is durable, reliable, and built to last. The success of your hunt can be determined with the trail camera that you choose to use. When you’re in the wild, your trail camera becomes your eyes and ears. Therefore, when choosing the right model, you should keep the quality in mind. It must generate high-quality pictures of the game and must allow you to analyze the data later on in your cabin. 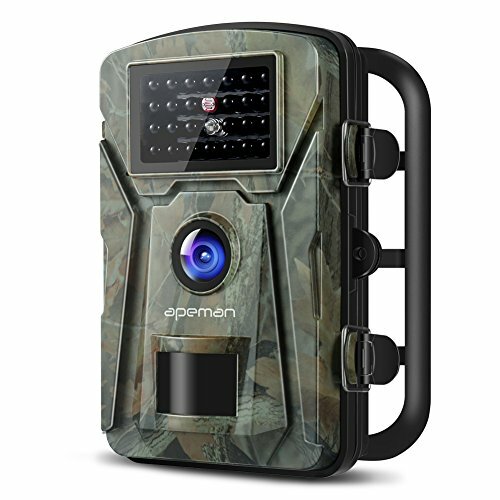 Take a look at this Apeman wildlife trail camera. It is best known for its durability and advanced features. The camera can generate an image with 20-megapixel clarity and 1080P video resolution. Every hunter knows that a high-quality picture can deliver all the details of the game that you need to pay attention to. It also helps you to predict their next path and ensure that you can track them down. So, what are the key highlights of this product? Let’s start with its super fast trigger speeds. We all know that some deer are very cautious. They can zoom past your trail camera, and if you have a poor-quality model, you will most likely end up capturing blurred images of what seems like a deer or a bear—you couldn’t tell. It sounds frustrating, right? 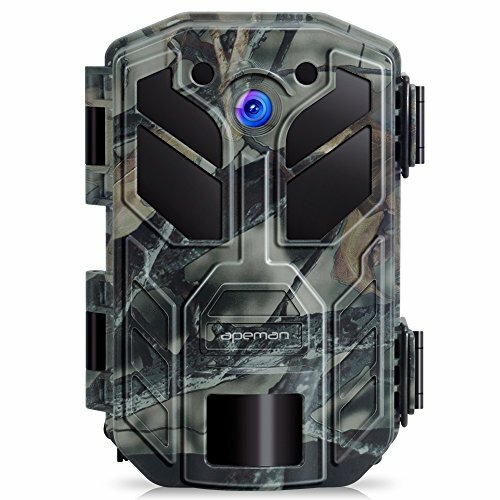 But with this Apeman trail camera and its super fast trigger speed, you can experience a trigger speed as fast as 0.2 seconds. Thanks to its central PIR sensor, any movement, even the tiniest movement from the perimeter can be captured. Aside from this feature, this model is also known for its 40pcs ow glow IR LEDs and excellent nighttime shooting performance. This game camera works with 40pcs low-glow black IR LEDs that can provide light for up to 65 ft. If you’re tracking down an animal that travels by night, this game camera can provide high-quality black and white photos for you. Trail cameras are designed to be durable and should be able to withstand the harsh elements of nature. This model has an enhanced IP66 waterproof structure. This helps to prevent the moisted lens that could lead to blurry images. Aside from that, it protects the camera from the harsh weather and ensures that the water doesn’t seep inside the system. Lastly, it also has a two-inch LCD screen that allows you to preview the images while on the field, allowing you to do the necessary configuration of settings for well-captured images. Not to mention that they offer excellent customer service to their customers. If durability is your main concern when looking for your new trail camera, you should consider taking a look at this model. 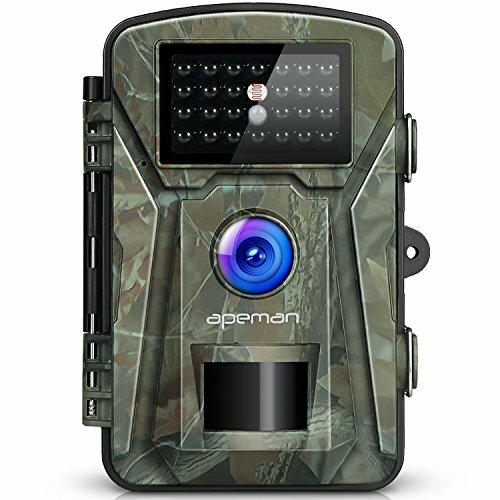 The upgraded entry trail camera from Apeman is best known for its robust construction and no-nonsense controls. This is ideal for hunters who aren’t tech-savvy and wants a simple mechanism of their game cameras. Let’s start with the resolution. The camera can take 16MP images and record 1080P videos for both daytime and nighttime. For its flash range, it can reach up to 65 feet and thanks to its fast trigger speed, rest assured that it can capture any moving objects within the perimeter. You can save yourself from the frustration of blurred photos thanks to this handy feature. Another feature that makes this trail camera appealing to most hunters is its upgraded quality of nighttime shooting. The game camera works by freezing the motion and capturing the animal at its best angle. Most animals are cautious of any flash lighting. This game camera features a no-glow night flash. In that way, you don’t unintentionally scare your animals away when taking pictures. It also secures your camera into its place and lessens the risk of theft. 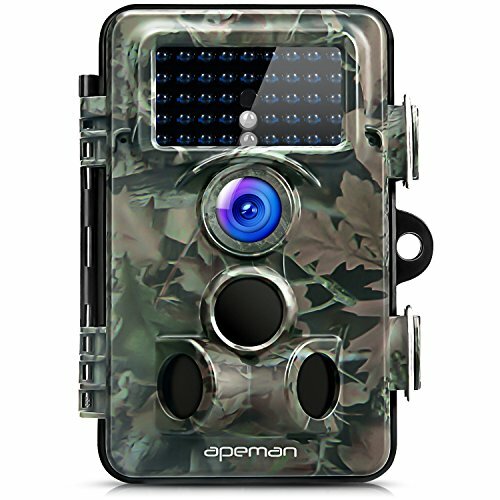 Similar to the previous model, this game camera also features IP66 dust and waterproof design. Both the lens and LED lights do not depend on the camera’s housing. This waterproof and dustproof camera can withstand the harsh elements of nature, be it rain or storm. For previewing your photos in the field, it comes with an LCD screen that only measures two inches, allowing you to view the images taken with your game camera. All images have dates, temperature, and time when it was taken. Lastly, for upgraded security purposes, this game camera allows you to put a security password. In that way, no one can access your trail camera without your permission. If you’re on a budget, you might want to take a look at this model. This game camera is designed to capture the magnificence of wildlife without blurs. Its sturdy housing and reasonable quality of images are well worth the price. The images that this game camera can generate are of 12-megapixels resolution. Rest assured that the images are bursting with vibrant colors and life. The images that it produces when captured at night are black and white graphics with rich details. This game camera will take up to nine photos once it detects any motion within the perimeter. To give you the details that you need when analyzing your target, its 1080P video also has rich sound quality. Aside from that, this trail camera features a lightning trigger speed. It will only take 0.2 seconds to capture once it detects motion. Thanks to its 130-degree wide-angle lens, rest assured that you’ll be able to capture at a reasonable range. Rest assured that with this trail camera, you’ll be able to document any detected actions in the forest. Not just that but this camera allows you to set the interval recording, use the time-lapse, protect the camera using a password, and notification for low batteries. Let’s proceed to the housing. This trail camera has a waterproof design and is constructed solidly. Even if you leave it in the middle of a thunderstorm or heavy snow, it can withstand the harsh elements and will continue to document the wildlife. If you’re planning to use it as an alternative to your CCTV system at home, you can rely on its excellent sensitivity. Clear images are a crucial factor to consider when purchasing a trail camera. This trail camera allows you to capture stunning images of the wildlife with its upgraded lenses. It is designed for your hunting and home security needs, enabling you to make use of the camera when it’s not hunting season. This trail camera utilizes a low-glow PIR technology that has an automatic IR filter. It also has an infrared low-glow LED so that when taking pictures of the wild, the camera won’t steer the animals away with its flash. Designed to capture the best of the wildlife, it has a trigger speed of less than one second. As soon as the camera detects motion from a distance, it will automatically capture several shots in less than a second, so you don’t miss a chance of capturing the best animal photos. Aside from that, it also has a broader range and 90-degrees detection angle. The animal doesn’t need to wander near the game camera to be captured. Rest assured that you’ll be gathering greatly-captured photos of the wild once you retrieve your device. Lastly, it features a 2.4-inch LCD, allowing you to preview the photos while you’re in the wild. In the screen, you can control the timer, the time lapse, and even the time stamp. Buyers can enjoy a one-year warranty upon purchase of the product. If you have extra budget, you should take a look at one of the Apeman’s pride. This trail camera is best known for its high-quality images and high-definition videos, ideal for both pros and novices in hunting. This trail camera can generate images of 20-megapixel resolution and 1080P video resolution. Rest assured that every time you retrieve the camera, you will be rewarded with crisp and detailed photos. Richly-detailed videos and photos are both crucial in studying your target animal should you plan to plot your next move. Also, its trigger speed is shorter than usual. Once the game camera detects any slight movement from the perimeter, it will capture the subject in less than 0.2 seconds. In that way, you won’t miss great photos of bucks traveling at night or a wandering coyote in the area. Each picture is stamped with time, temperature, and date for better analyzation. One of the key highlights of this device is the excellent quality of its nighttime shooting since it is backed with 40-pieces low-glow black IR LEDs that can provide light for up to 65 feet, rest assured that you’ll be able to bring home stunning nighttime photos of animals traveling and looking for food. What’s more, is that it has an enhanced IP66 waterproof construction. It prevents dust, dirt, and water to seep and cause damage to the device. It also keeps the lens free from moist that can lead to blurred images. This trail camera is designed to be tough and can withstand the harsh elements of nature. For our last item, we have the high-performance game camera suitable for customers on a budget. It’s an ideal choice if you’re still a beginner on hunting and wants to experiment with installing game cameras in the forest. It’s durable, reliable, and not to mention, sold at an affordable price. 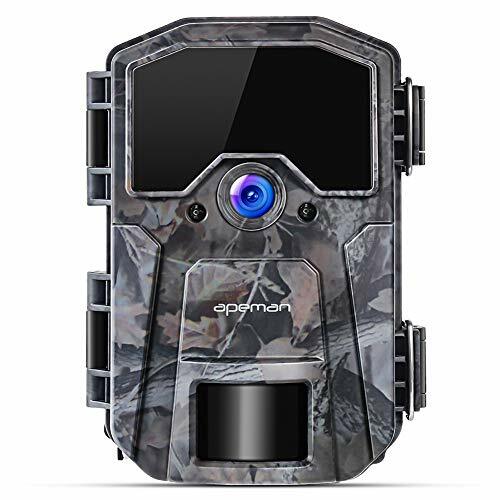 This trail camera can produce images of the 12MP resolution, providing rich details and excellent sound quality of the recorded videos. It features a multi-shot mode that allows you to capture up to three pictures in just a single detection of motion. Aside from that, this camera utilizes 940nm invisible infrared technology. Thanks to its automatic IR filter, rest assured that even the wildest behavior of the game can be captured with its lenses, no matter how fast it moved. It has 26 LEDs integrated to ensure that you’ll go home with stunning nighttime images. Moreover, both the IR flash range and the trigger distance can reach up to 65 feet. It doesn’t disturb or scare the animals while they are being documented in their natural habitat. Lastly, it is built to withstand the heavy rain, storm, or snow. Its IP66 waterproof design and compact housing allow you to install your game camera in a tropical forest or desert without the worry of getting damaged when you retrieve it. This trail camera provides all the basic needs a hunter must need to capture the best of photos.